2016 Freedom Rally this Saturday at Noon! Dinesh D’Souza, Michelle Malkin, Todd Starnes and Congressman Greg Walden! 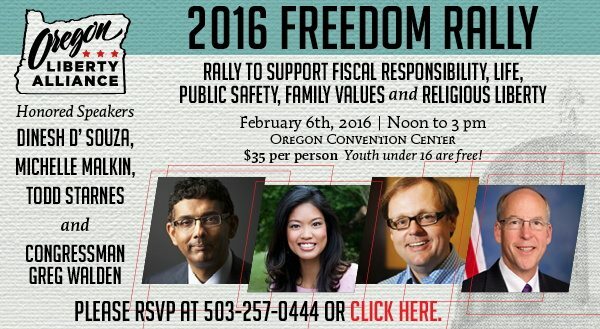 Oregon Liberty Alliance member organizations are hosting the 2016 Freedom Rally on February 6th, 2016 at the Oregon Convention Center in Portland. Join with fellow conservatives to show your support for Life, Common Sense Governance, Family Values, and our 1st Amendment Rights. Hear from acclaimed filmmaker and author Dinesh D’Souza, nationally syndicated columnist Michelle Malkin, Todd Starnes of Fox News and Commentary, and Congressman Greg Walden as they address today’s most pressing issues from a conservative perspective. Also, enjoy a catered lunch, book signing opportunities, and networking with hundreds of conservatives from around the state. More than 1,500 people attended last year’s rally. Your attendance is critical this year! Oregon needs to hear our voice, our views, and our values. The 2016 Freedom Rally is a place where that voice can be amplified. Register today at www.oregonlibertyalliance.com. The registration cost is $35 per person with lunch included. Those 16 years and under are free to attend the event at no cost.